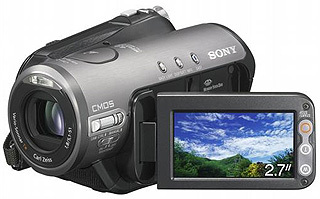 Sony HDR-HC3E digital high definition HD video camera is a HDV1080i Handycam camcorder that provides professional level high quality HDV video capture in an easy to hold compact size package. Sony HDR-HC3E features HDV 1080i format video support, HDV or DV recording switchability, ClearVid CMOS sensor, Enhanced Imaging Processor, Carl Zeiss Vario-Sonnar T lens, 10x optical zoom, 80x digital zoom, 2.7″ Wide Hybrid Clear photo LCD plus with touch panel, wide colour viewfinder, 4 megapixels still image recording, built in flash, dual record capability with ability to capture up to 2 megapixels still image while recording movies, smooth slow Rec feature, HDMI output for HD ready TV, i.LINK in and out port for HDV and DV, video S-video and component output. TrustedReviews reviews Sony HDR-HC3E HD video camera and concludes that if you’ve used the HDR-HC1E or Sony’s more professional HDV models for any length of time, you can’t help feeling disappointed by the HDR-HC3E’s lack of prosumer features. All that video quality, with so little user control. But then there’s the price. With some e-tailers already listing this model for $800, HDV has clearly arrived in the mainstream, albeit the high-end thereof. We can’t recommend the HDR-HC3E to semi-professional filmmakers – the much more expensive HVR-A1E based on the HC1E is the most cost effective choice here, or grab the latter while you still can. But if you’re an early-adopting consumer looking to capture family moments and holidays in stunning HD video, the HDR-HC3E’s superb image quality, price and portability make it the ultimate point-and-shoot camcorder.